The sudden storms hitting Klang Valley had caused flash floods in Kajang on Friday (02 Dec 2011) and also brought the traffic in KL to a standstill. If you make a search in Google for Kajang floods and youtube and you will see many clips being put up on the situation on Friday afternoon, including one where a woman was rescued from the top of a van. So whilst the rain is the talk of the town, let me post some pics of the showers that occurred yesterday (Saturday 03 Dec 2011). 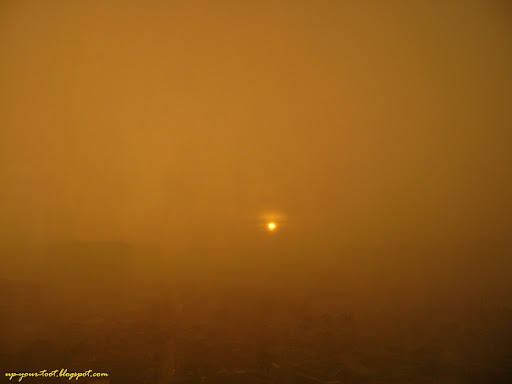 At 6pm, the clouds were not that thick and sunlight from the setting sun peeked through the clouds. 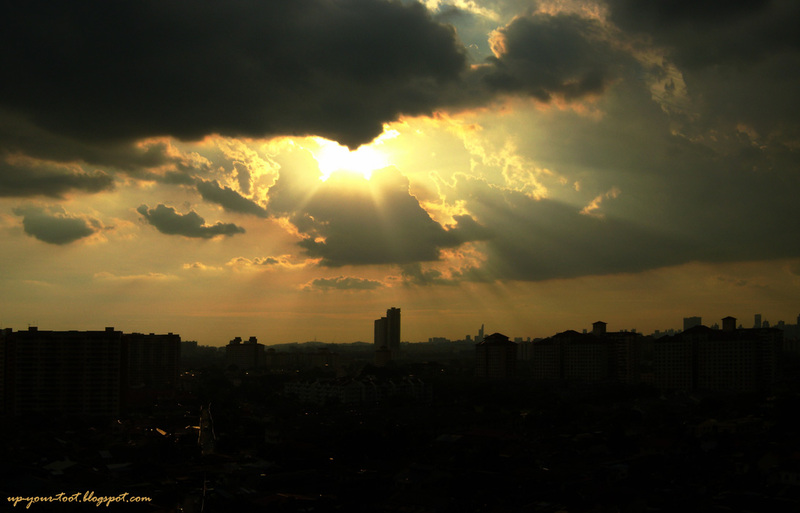 Then the clouds started to roll in silently, and the heavens just opened up. I could see plastic bags being tossed about in the wind, doing acrobatic somersaults in the rain. After a while, thunder and lightning were going off all around the place. The dark clouds came creeping in. And the heavens opened up. The rain started from the right hand side of the picture. 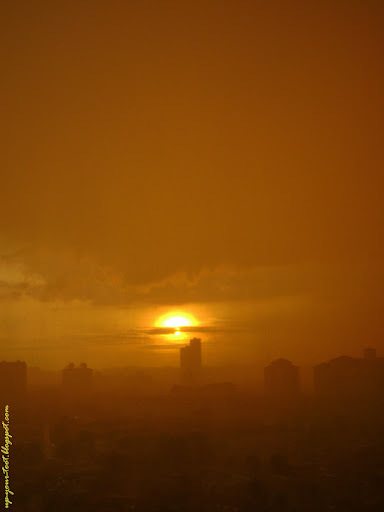 Sunset in the rain. The vertical 'blurry' lines are rain falling down in sheets! Everything turned 'white' and fuzzy with the heavy downpour. 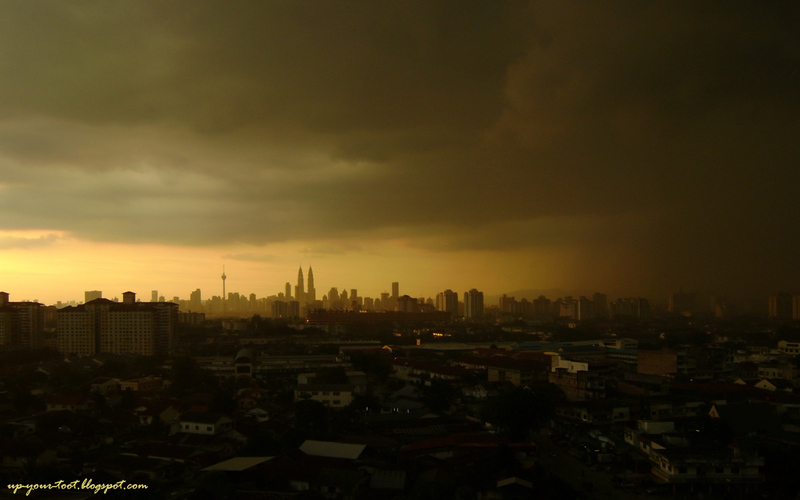 Around this time, lightning and thunder were going off all around KL. Visibility was cut down by the rain. 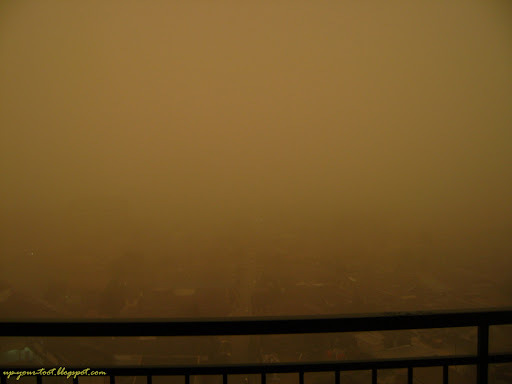 The houses and the western city skyline had disappeared under the blanket of rain. About an hour after the rain had started, it thinned down before stopping, revealing a beautiful city skyline with the twilight painting colours in the evening sky. By 7.30pm, the rain had cleared and we get a beautiful twilight and the city lights again! Langit dan awan at Klang Valley so emotional these days.